We have pretty much seen the LG G3 in all its glory for the most part. 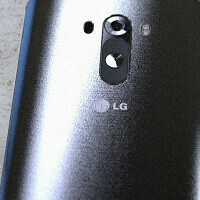 A tipster sent us another image of the next LG flagship with the brushed plastic effects on a black and white unit. The picture is medium quality, so there is not much detail other than what we have seen already, but it does accentuate the brushed back-plate motif we saw when the gold G3 image leaked a couple days ago. We are not able to confirm the source that sent us this pic, but along with the picture, the tip did state a 5.5-inch screen for the device. Compared to the recently released LG Isai FL in Japan, the G3 will be shorter, narrower, and thinner, which is an interesting twist to another rumor floating around about the size of the device. Furthermore, the source says that the back plate is removable. We are not sure that would be part of the final package in all markets, but a removable back piece is certainly a possibility for some areas. While we get to see the black and white somewhat clearly, what we presume to be a gold G3 up top is resting with the screen-side up. The finish looks a lot more polished than one might expect at first. 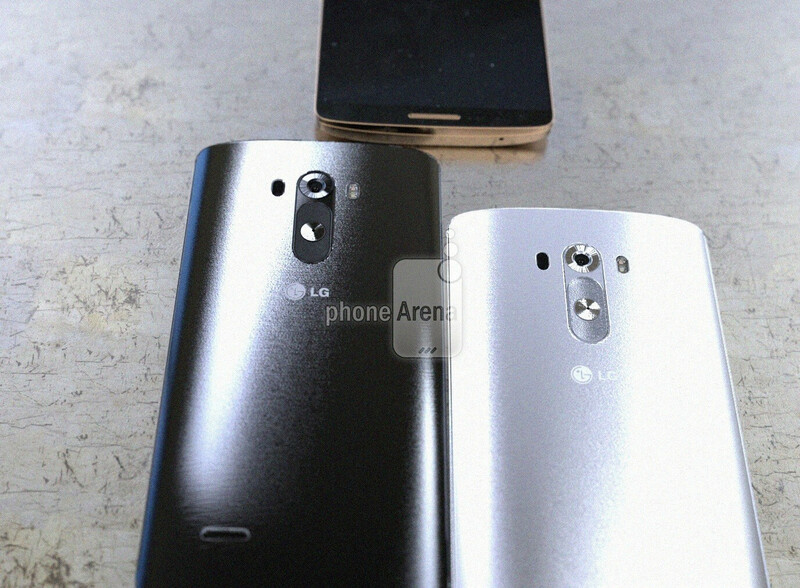 Overall, the picture is consistent with other sightings of the LG G3 that have made their way to the internet. May 27th should tell us more, but we will always take an early peek if the opportunity arises. Thanks to our anonymous tipster for the image! Looks a lot nicer than a band-aid. I smell a samsung fanboy! Is that a Samsung style home button I see on the phone? Front camera is under the glass. It just doesn't show up well with this angle/lighting. That is not the top of the phone, they do not put the microphone hole at the top of the phone. Its always at the bottom where your mouth is at while holding up to your ear. So clearly that is the bottom of the device. Plus that is a solid button, no holes for sound to escape if that were even supposed to be the speaker. you are dumb. that is the top of the phone obviously. it even looks strikingly similar to the top of the g2. they are not going to put a home button on the g3. and what you see that you think is a mic is the IR blaster. The image resolution is 1377 x 1012; try opening it in a different tab. If it's like the LG Isai, the front camera is placed on the bottom bezel, so that's why it doesn't appear at the top. The top bezel in this image looks a little bigger than the last Isai that I saw. Hopefully the front camera is on the top. Well Isai phones are asymmetrically designed on the top and bottom. So I'm pretty positive the Front facing camera is going to be on the top. Also, the G3 is going to have smaller bezels and better design than the Isai FL. The G2 has smaller bezels than the original Isai and has a better symmetrical design. I'm always looking forward for this! LOL, nice. Not that I have a problem with buttons on the back, but I do get some strange looks. The Camera + 2 sensors is on the left side of the phone (right on the pic cause its on reverse.. you can see it if you look closely. Good eye, assuming that's not dust or a reflection. Doesn't sell anything. No wonder why one company makes billions every month, another is struggling to survive. Shows what is better for *consumers*. Though for trolls, it's a different story.